FBI Special Agent in Charge Gordon Johnson is retiring from the FBI. He shared rare insight into his time at the agency and most memorable cases. 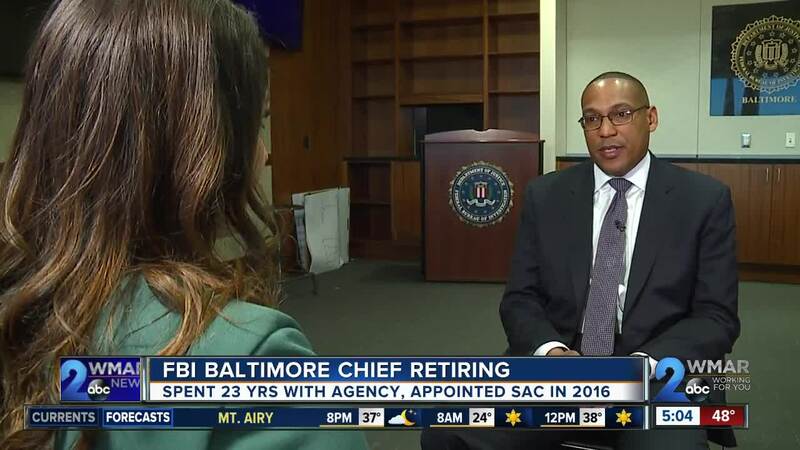 BALTIMORE — The head of the FBI Baltimore Field Office is stepping down at the end of the week. After 23 years with the agency, Special Agent in Charge Gordon Johnson is retiring. Johnson was appointed as SAC in Baltimore in October of 2016. For the last two years, he’s overseen operations in Maryland and Delaware. He was inspired to join the FBI after seeing the agency's response in the wake of the 1995 Oklahoma City Bombing. And he's now leaving after helping to prevent what he believes could've been a domestic terror attack. U.S. Coast Guard Lieutenant Christopher Hasson was arrested a little over a week ago. FBI Baltimore and Coast Guard investigative service agents discovered 15 firearms and more than 1,000 rounds of ammunition in Christopher Hasson’s Silver Spring home. Investigators also found the manifesto of a Norwegian domestic terrorist and list of potential targets that included Democratic legislators and media personalities. Johnson said this is one of the cases that kept him awake at night. "I did not sleep well from the time I heard about that case until he was arrested," said Johnson. "They only have to get it right once, we have to get it right every time. And when we do get a case like that and you see the result, and you realize we took a number of weapons, significant amount of ammunition off the streets, each one of those rounds of ammunition could’ve been an individual tragedy. But that’s what keeps me up at night, people like that that I’m unaware of." “A lot of this violence didn’t happen overnight, and it took some time to get to where we are. And I know working together with our BPD [Baltimore Police Department] partners, we’re going to get control of it, but it’s going to take some serious partnership and collaboration,” Johnson said. But when asked by former Baltimore Police Commissioner Kevin Davis to take over the case of Detective Sean Suiter killed with his own service weapon, the FBI declined. “I think it’s more appropriate for me not answer that for a host of reasons including number one, the letter went from the BPD commissioner to the director of the FBI. The FBI at FBI Headquarters responded to that, so I think that answer has to suffice,” said Johnson. FBI Baltimore agents did, however, take down a group of corrupt police officers known as the Gun Trace Task Force. “The community doesn’t get better, it doesn’t improve, it doesn’t function the way it should if public officials are betraying their oath for personal gain,” said Johnson. And the one case he’ll always remember is that of Richard Collins III murdered in May of 2017 in an alleged hate crime. “It’s just a total tragedy. That’s one that sticks out, and I’ll carry that one into my retirement,” said Johnson. He also addressed the organization’s efforts to recruit more agents, and how political battles have impacted employees and public perception. "This is the FBI Field Office and though the FBI is a national organization, what we do is really local and I really want people to understand when you call your FBI, your local FBI, you’re calling a person that lives in your community and we take it personally," Johnson said. "I wanted to carry the banner for the people here in the Baltimore Field Office and let you know every day the men and women of the FBI are doing what they can to protect this community." Johnson added that he feels honored and privileged to have served with the men and women in the FBI Baltimore and Delaware field offices. Johnson is retiring at the end of the week. He plans to take a break then seek opportunities in the private sector.